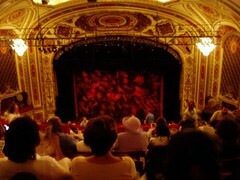 We had pretty good seats, we were 3 rows from the front....uhm, I mean BACK in the balcony. It was hot and stuffy but we had a good view of the stage. Really, we didn't want to see their faces anyway.